The mac n cheese coneflower is a sight to behold, featuring brilliant yellow petals with a large orange-green center cone set against a backdrop of rich green foliage. It is well branched and strong with a bushy habit. 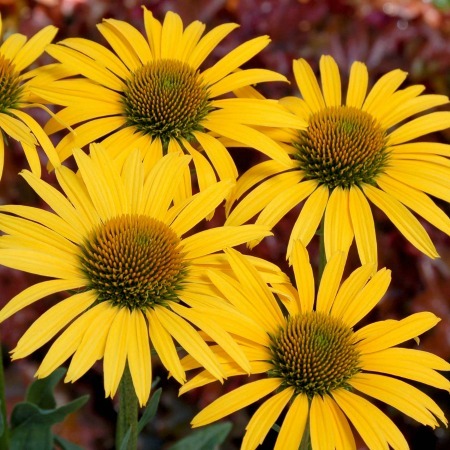 This mid-sized echinacea variety has very strong stems supporting the sunny florets. The stems can reach heights of 26 inches. The beauty of the mac n cheese probably lies in the fact that it never fades. This makes it a perfect choice for showy gardens. This deciduous yellow flowering hybrid blooms from July through to October. It also has a fast growth rate finishing in just 6-8 weeks. It grows well on average soils that are coarse and slightly mineral in nature. The mac n cheese is tolerant to most soil types with the exception of swampy soils. This award-winning echinacea has average watering needs requiring little moisture once it is fully established. It grows most actively in spring and is pretty much dormant in winter with the flowering season mostly occurring in summer and fall. For neatness, the old foliage should be removed before new leaves begin to emerge. Deadheading will prolong bloom time and keep the garden neat. Clumps may be divided every 2-3 years. Not a complicated process, and it is almost trouble-free with the exclusion of it being a delicacy for slugs. This warm variety is attractive to butterflies and bees and is quite hardy being deer and drought resistant. Like its counterparts the tiki torch, mango punch and tomato soup coneflowers, the mac n cheese is a fiery addition to cottage and rustic style gardens. It is beautiful in borders, containers or as part of a mass planting. It can even stand alone as a specimen plant and hold its own as a focal point in your garden. You can buy echinacea online here at GreenwoodNursery.com. Mac N Cheese Echinacea is grown in a trade gallon container. Orders shipping to CA or AZ may be bare rooted before prepping to ship.